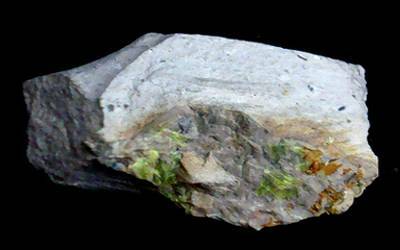 Idrialite, or idrialine, is a soft, orthorhombic hydrocarbon mineral with chemical formula: C22H14. 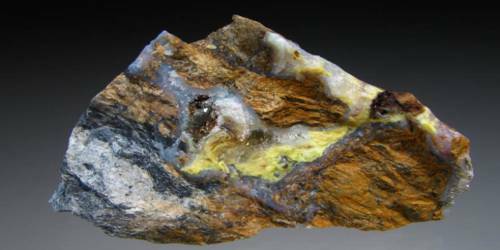 It is a mineral probably occurring as a crystalline hydrocarbon and melting at 205° C. It is usually greenish yellow to light brown in color with bluish fluorescence. Raman spectroscopy studies indicate that it may be a mixture of complex hydrocarbons including benzonaphthothiophenes (chemical formula: C16H10S) and dinaphthothiophenes (chemical formula: C20H12S). It has historically also been known as branderz, idrialine, and inflammable cinnabar due to its combustibility. When distilled, it produces the mineral wax idrialin. It was first described in 1832 for an occurrence in the Idrija region west of Ljubljana, northwestern Slovenia. It also occurs at Skaggs Springs, Sonoma County, western Lake County and the Knoxville Mine in Napa County, California. It has also been reported from localities in France, Slovakia, and Ukraine. Association: Cinnabar, pyrite, gypsum, quartz, “clay” (Idrija mine, Slovenia); metacinnabar, realgar, “opal” (Skaggs Springs, California, USA).